We have independently reviewed, rated and compared the Zero Breeze air conditioner. 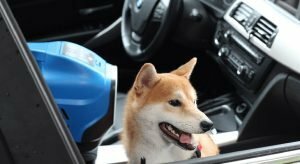 We humans sure enjoy our creature comforts, and thanks to technology and some clever innovators it is becoming easier to bring things like air conditioners along for the ride when we go camping or enjoy the great outdoors. And if there’s one thing that’s true it is that Americans love their air conditioning. According to the Residential Energy Consumption Survey, 87% of American homes have AC units installed – a number that is up from 68% in 1993. In this article we review the Zero Breeze AC Unit. What Is the Zero Breeze? Zero Breeze is a completely portable, battery-operated cooling system for times when you’re on-the-go. Its interchangeable batteries operate for approximately 5 hours each to keep you cool, while also working as a dehumidifier. 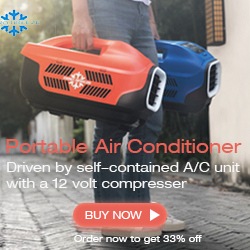 Initially designed as a compact AC unit for camping, consumers are also finding the small 12-pound unit perfect for dorm rooms, small cabins, RV campers, inside your vehicle (for yourself or pets), tailgating and more. You might even want to set it up right next to you the next time you hit the beach, as it works as well outside as it does inside. But is it worth the cost? Let’s take a look. How does the Zero Breeze portable AC function? 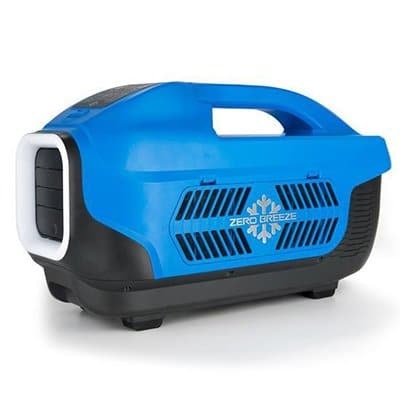 The Zero Breeze works on a small, rotary compressor, which means that compared to other portable cooling units the Zero Breeze is a real air conditioner. How does it function though? The marketing is a little tricky on this one because the Zero Breeze is advertised as a fully portable AC unit great for camping and the great outdoors. However, the item that makes it portable is a 12V battery, and unless you purchase their “Plus” version the battery is not included and will need to be purchased separately (to the tune of $300+). The standard Zero Breeze unit comes with an AC/DC power adapter that will allow you to plug the unit into your wall outlet or car. The type of battery the Zero Breeze uses is a 12V battery. These batteries are becoming increasingly popular in the world of small appliances, such as leaf blowers, lawn mowers, weed whackers, etc. Many of these products use 12V batteries that can be interchanged with one another seamlessly. It should be noted that the Zero Breeze Smart Battery can only be used with the Zero Breeze. Normal operating life is 5 hours, and charging time is also 5 hours, so if you’re camping overnight you will need to consider a second battery or additional power source. Where can this battery powered 12V Air Conditioner be used? AC units are becoming more popular with tent campers because we like comfort. Nobody goes camping with the intention of being hot and sticky all night! The 12V battery is great for tent camping because you don’t need to be hooked up to a power source (except to recharge, of course). The only caveat is that you will have to hook up your exhaust pipe so that it is venting out of the tent. If you don’t, the backside of the unit will essentially be blowing even hotter air into your enclosed space from the compressor. Worse yet, the condensation will have nowhere to go, and you’ll likely wake up in a puddle created by the dehumidifier. You’ll thank us when you remember to use the venting kit! For cabins with electricity, it would be wisest to use the AC adapter to plug the Zero Breeze into a standard outlet. And don’t expect that the unit will completely cool your cabin. At 1,100 BTUs, the Zero Breeze is designed to cool only about 50 square feet of space (think about the area of a full-sized bed). It might not cool the whole cabin, but it can be a friendly bedside coolant on a hot summer’s night. Making sure the battery is charged, you’ll also have a cooling source with the 12V smart battery if the power happens to go out. Using the Zero Breeze in a car or truck for short periods of time is ideal for use with the 12V battery. After all, most cars already come equipped with an AC unit for while the car battery is running. This product allows you to use AC in situations like waiting in the carpool line, eating lunch or grabbing a quick nap in your car during a work break. Of course, never leave your pet alone in a warm vehicle as this could lead to harm to your pet. For that reason, we do not recommend using the zero breeze for that purpose. The Zero Breeze can also be used outdoors. With your smart battery, it can be easily used anywhere – whether you’re at the beach or in your backyard. The specs will obviously be a little bit different when you’re outdoors, as the unit will have to work harder to cool the surrounding area and the cold air will fast escape. For best results, when using the Zero Breeze outdoors, we recommend using in the shade and right next to where you want to cool. As we’ve mentioned a couple of times, the Zero Breeze does NOT come with the smart battery included unless you purchase the Plus model. Smart batteries can be purchased separately and currently run for over $300 – and they are not interchangeable with other battery models. To obtain a full charge, you will need to charge your battery for about 5 hours, so if you’re planning on making batteries your main power source, we recommend purchasing at least two. The setup of the Zero Breeze is pretty easy, as the unit is almost ready to go right out of the box. The one thing that users tend to overlook is the condensation pipe/exhaust. While not required for use, the vent pipe is the only way to keep condensation from creating a puddle on the ground by your Zero Breeze. I highly recommend having the pipe aimed into a bucket or pan. Noise levels are measured by dB, or decibel rating. The Zero Breeze, based on what setting you’re using, comes in from 55-65 dB. For reference, this range falls somewhere between a moderate rainfall and a conversation and is considered moderate to quiet in noise levels. Most portable room air conditioners fall in the range of 50-60 dB, so the Zero Breeze might be considered on the upper end of that but over all wouldn’t be too much louder. Air conditioners run on BTUs, or British Thermal Units. In general, the higher the BTU number, the more area the air conditioner can cover. The Zero Breeze runs on just 1,100 BTUs and can cover approximately 50 square feet of enclosed space (this will be a smaller range if you’re in a tent or outdoors as the cool air will easily escape). Most portable AC units run on at least 5,000 BTUs. EER stands for Energy Efficiency Rating, and the Zero Breeze is rated a 4. This number is calculated by using BTU/wattage. Since the Zero Breeze is 1,100 BTUs / 275 watts, the EER is 4. The higher the EER, the more energy efficient that product is, so the Zero Breeze is relatively low on the chart. However, products with a higher EER in this category are usually larger (bulkier) and run on more BTUs (meaning they provide more cooling space). 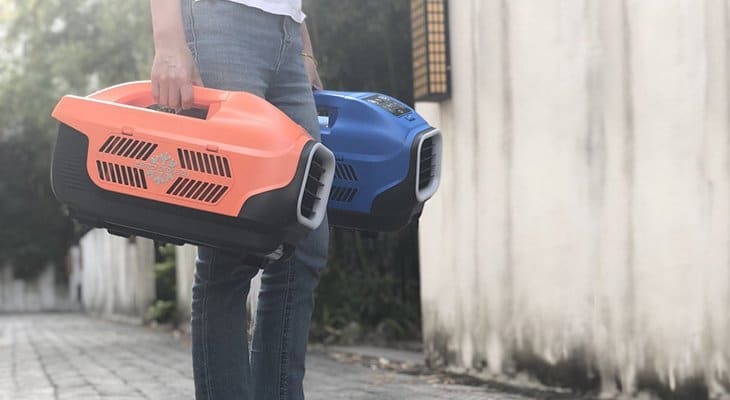 Its all relative to the exact type of portable AC that you’re looking for, but EER is definitely something to keep in mind. Unlike most room or portable air conditioners, the Zero Breeze is not designed to cool an entire room to a set temperature. It is made specifically to cool the area right in front of the fan for more personal comfort for you and your guests. The company claims that the Zero Breeze can cool a tent from 90℉ to 72℉, but unlike other AC models you won’t find a built-in thermostat that allows you to set or reach a direct temperature. Many people are drawn to the Zero Breeze for all of the “extras” – and there are quite a few. The Zero Breeze has two USB charging ports for your phone or accessories, as well as a Bluetooth speaker. The unit also features LED lights – both a nightlight and SOS red flashing light. Keep in mind that using the USB ports or other available features will also consume power off of your unit when using the smart battery, and thus shorten the length of time the battery will stay charged. At max speed and with use of the extra features, some users have complained that the battery lasted barely an hour. Lots of extras, including a Bluetooth speaker, USB charging port, flashlight, emergency light, etc. Only the Zero Breeze PLUS comes with a smart battery. The main unit comes with an AC/DC power cord. Sold separately, the battery for the Zero Breeze is over $300. The Zero Breeze Smart Battery cannot be used with other products like other 12V batteries. The exhaust exchange actually creates hot air out of the back of the unit, which over time mixes with the colder air from the front of the unit for a less desirable effect. When it comes to portable AC for tent camping, we recommend this Frigidaire Window-Mounted unit. It might seem a little silly, or even counter-intuitive to use a window room AC on a camping trip, but the idea is gaining more traction. This model can be plugged into a standard outlet at your campsite and easily vented through your tent. In fact, many tents are now being manufactured with a built-in vent for this specific purpose – check out this Ozark Trail Tent. This Frigidaire unit runs on 5,000 BTUs and will keep an area of up to 150 square feet cool. Not too mention it’s about a third of the price of a Zero Breeze unit. For small cabins with electrical hook-ups, an item like the Zero Breeze is going to do zero good because it just isn’t built to cool the space efficiently. That’s why for areas of up to 450 square feet we recommend the Haier Portable Electronic Air Conditioner. It’s slightly larger than most portable air conditioners at 55 pounds, but at 12,000 BTUs you will feel the room instantly becoming cooler. The unit also works as a dehumidifier, so no more sticky wet summer nights. Units like these are easily hooked-up and ventilated through a window and most are super quiet, so you’ll likely forget its even there. Most cars and trucks are manufactured with their own fans and AC units already, but sometimes you want a little more and that’s where a product like the AboveTEK 12V DC Electric Car Fan comes in handy. This small but mighty double-fan has got your back when you come back to your car after it has been sitting in the bright sun for several hours, or if you just need a little extra breeze. It comes with a nine-foot cord, so it can be placed anywhere within your vehicle and works well right off your car’s battery. No more do you need to be running your engine just to have a cooler car while you eat your lunch or sit in a carpool line. It doesn’t have the AC component, but you will feel like it does. 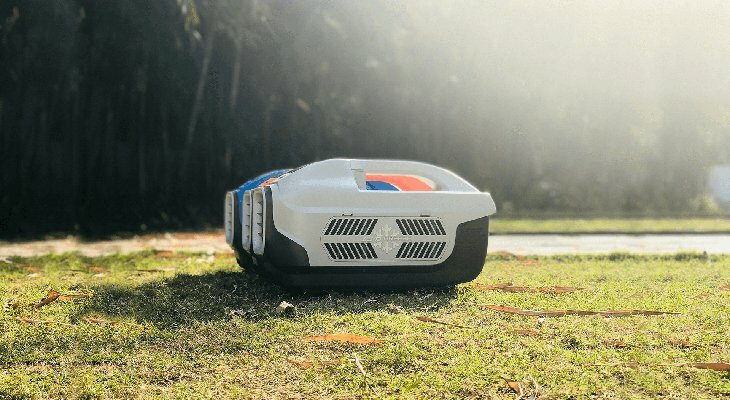 Jay Lee is one of the original backers of the Zero Breeze Kickstarter project, and couldn’t wait to review the product in its fullness. See what he has to say about his new AC unit in his YouTube video. After trying his Zero Breeze, Richard has doubts that it could cool a hot car during the day, but thinks it would be sufficient for cooling a tent overnight. Check out his review on Does It Really Work? The folks on iReview have mixed feelings about the Zero Breeze. Some users are very happy with their purchase, while others are having trouble getting in touch with customer service or even receiving their product at all. Yin Chi Guy shares his unboxing experience on the Zero Breeze website and shows views how to setup and run the unit. Reddit users on this post seem to agree that the Zero Breeze name is a play on how well (or little) the product works. Was this product a Kickstarter project on Indigogo? How was it received? Yes! Zero Breeze started on Kickstarter with a goal of raising $100,000. They quickly raised over $550,000 with over 1,100 backers. You can read more about their story here. The Zero Breeze was designed by a group of six self-funded guys led by Kelvin Ma, who remains the company’s CEO. No, this is an independent and unbiased review. All opinions stated are my own and we did not receive anything from Zero Breeze for this article. Does the Zero Breeze come with a warranty and returns policy? Yes, Zero Breeze has a 1-year warranty on all of their products. Returns must be submitted within 14 days of receipt. Where can you buy the Zero Breeze portable AC? Zero Breeze is currently only available for purchase on their company website. When it comes down to it, we think that Zero Breeze is a really “cool” concept that still has some growing pains to overcome. The unit with battery is currently selling for nearly $900, and for that price right now there are just better items on the market (see which ones we list above). According to their website, research and development has begun on the 2nd Generation Zero Breeze. We look forward to seeing how they improve the product. Stay tuned!